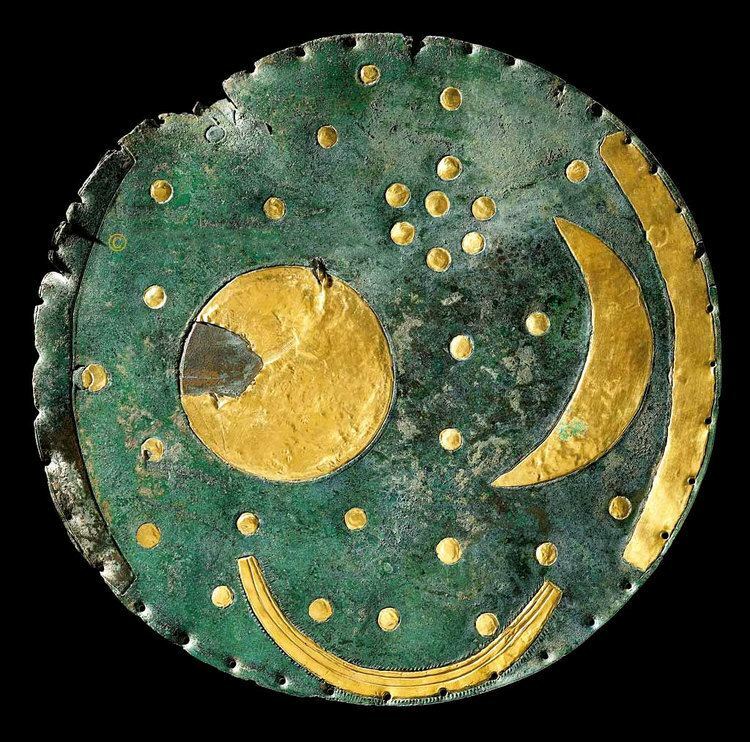 The Nebra sky disk is a bronze disk of around 30 centimetres (12 in) diameter and a weight of 2.2 kilograms (4.9 lb), with a blue-green patina and inlaid with gold symbols. These are interpreted generally as a sun or full moon, a lunar crescent, and stars (including a cluster interpreted as the Pleiades). Two golden arcs along the sides, marking the angle between the solstices, were added later. A final addition was another arc at the bottom surrounded with multiple strokes (of uncertain meaning, variously interpreted as a Solar Barge with numerous oars, as the Milky Way, or as a rainbow). The disk is attributed to a site near Nebra, Saxony-Anhalt, in Germany, and associatively dated to c. 1600 BC. It has been associated with the Bronze Age Unetice culture. The disk is unlike any known artistic style from the period, and initially, was suspected of being a forgery, but now is widely accepted as authentic. 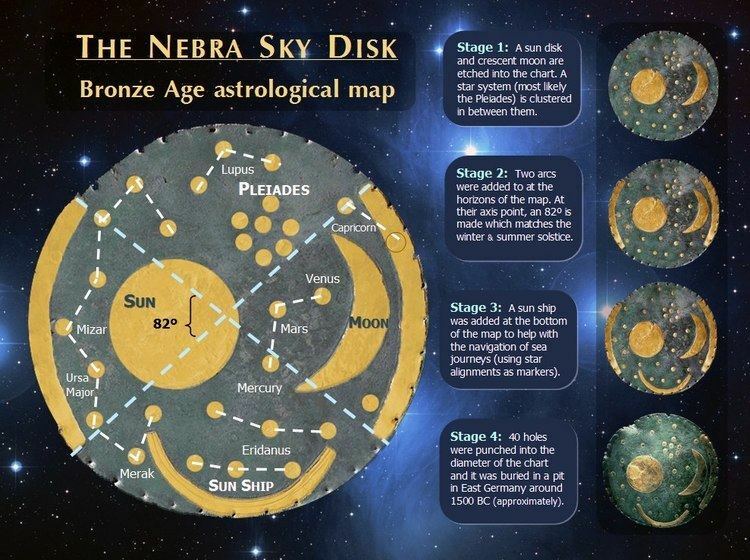 The Nebra sky disk features the oldest concrete depiction of the cosmos worldwide. In June 2013 it was included in the UNESCO Memory of the World Register and termed "one of the most important archaeological finds of the twentieth century." 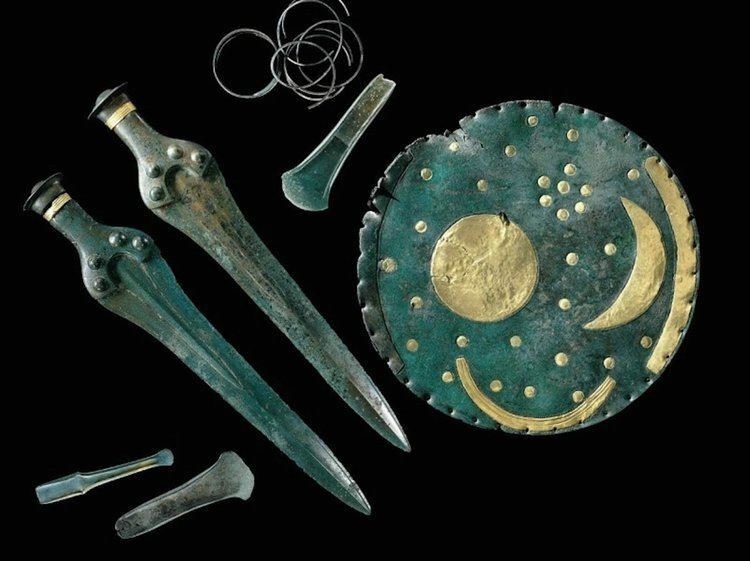 The disk, two bronze swords, two hatchets, a chisel, and fragments of spiral bracelets were discovered in 1999 by Henry Westphal and Mario Renner while they were treasure-hunting with a metal detector. Archaeological artifacts are the property of the state in Saxony-Anhalt. The hunters were operating without a license and knew their activity constituted looting and was illegal. They damaged the disk with their spade and destroyed parts of the site. The next day, Westphal and Renner sold the entire hoard for 31,000 DM to a dealer in Cologne. The hoard changed hands within Germany over the next two years, being sold for up to a million DM. By 2001 knowledge of its existence became public. In February 2002 the state archaeologist Harald Meller acquired the disk in a police-led sting operation in Basel from a couple who had put it on the black market for 700,000 DM. The original finders were eventually traced. In a plea bargain, they led police and archaeologists to the discovery site. Archaeologists opened a dig at the site and uncovered evidence that supports the looters' claims. There are traces of bronze artifacts in the ground, and the soil at the site matches soil samples found clinging to the artifacts. The disk and its accompanying finds are now held at the State Museum of Prehistory in Halle. The discovery site is a prehistoric enclosure encircling the top of a 252 metres (827 ft) elevation in the Ziegelroda Forest, known as Mittelberg ("central hill"), some 60 km west of Leipzig. The surrounding area is known to have been settled in the Neolithic era, and Ziegelroda Forest contains approximately 1,000 barrows. 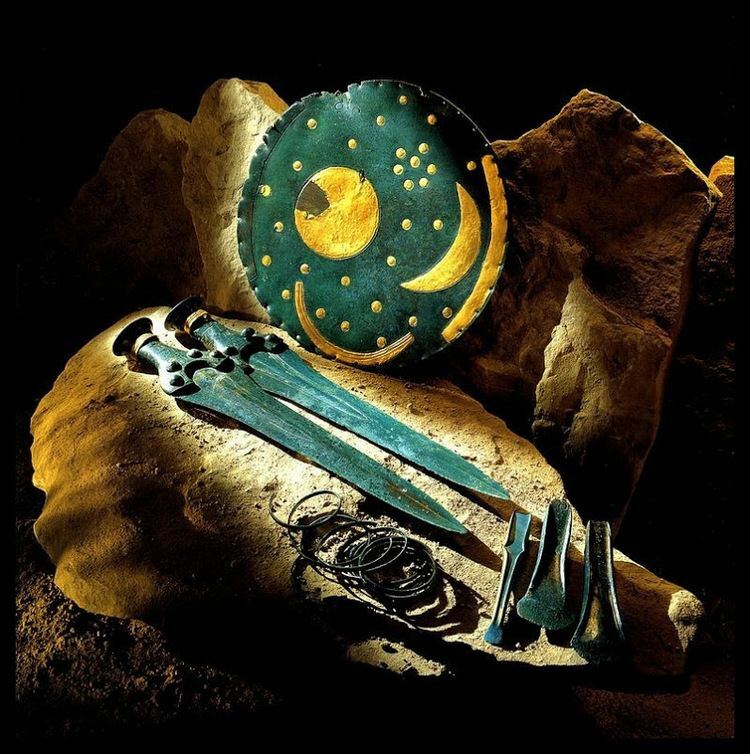 The precise dating of the Nebra skydisk depended upon the dating of a number of Bronze Age weapons, which were offered for sale with the disk and said to be from the same site. These axes and swords can be dated typologically to the mid 2nd millennium BC. Radiocarbon dating of a birchbark particle found on one of the swords to between 1600 and 1560 BC confirmed this estimate. This corresponds to the date of burial, at which time the disk had likely been in existence for several generations. According to an initial analysis of trace elements by x-ray fluorescence by E. Pernicka, then at the University of Freiberg, the copper originated at Bischofshofen in Austria, while the gold was thought to be from the Carpathian Mountains. A more recent analysis found that the gold used in the first phase was from the river Carnon in Cornwall, United Kingdom. The tin content of the bronze was also from Cornwall. Initially the disk had thirty-two small round gold circles, a large circular plate, and a large crescent-shaped plate attached. 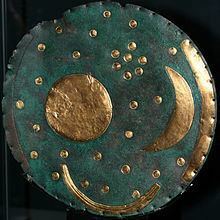 The circular plate is interpreted as either the Sun or the full Moon, the crescent shape as the crescent Moon (or either the Sun or the Moon undergoing eclipse), and the dots as stars, with the cluster of seven dots likely representing the Pleiades. At some later date, two arcs (constructed from gold of a different origin, as shown by its chemical impurities) were added at opposite edges of the disk. To make space for these arcs, one small circle was moved from the left side toward the center of the disk and two of the circles on the right were covered over, so that thirty remain visible. The two arcs span an angle of 82°, correctly indicating the angle between the positions of sunset at summer and winter solstice at the latitude of the Mittelberg (51°N). Given that the arcs relate to solar phenomena, it is likely the circular plate represents the Sun not the Moon. The final addition was another arc at the bottom, the "sun boat", again made of gold from a different origin. By the time the disk was buried it also had thirty-nine or forty holes punched out around its perimeter, each approximately 3 mm in diameter. The disk may be an astronomical instrument as well as an item of religious significance. The blue-green patina of the bronze may have been an intentional part of the original artifact. 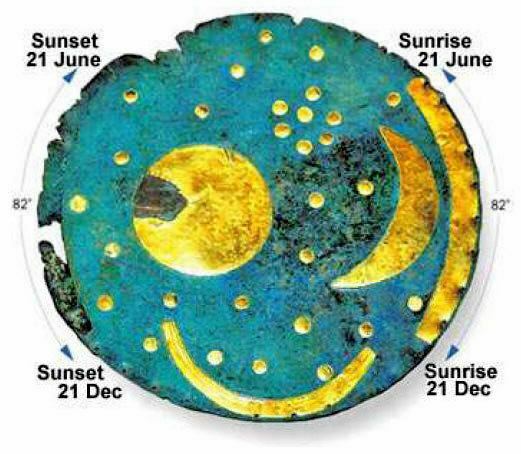 If authentic, the find reconfirms that the astronomical knowledge and abilities of the people of the European Bronze Age included close observation of the yearly course of the Sun, and the angle between its rising and setting points at summer and winter solstice. While much older earthworks and megalithic astronomical complexes such as the Goseck circle and Stonehenge had already been used to mark the solstices, the disk is the oldest known "portable instrument" to allow such measurements. Pásztor, however, sees no evidence that the disk was a practical device for solar measurements. 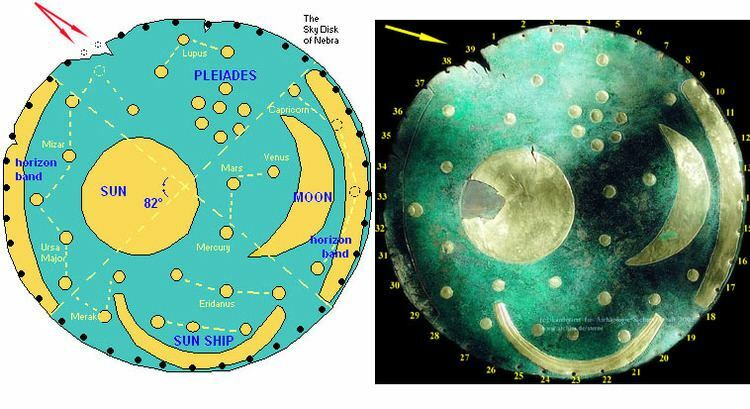 Euan MacKie suggests that the Nebra disk may be linked to the solar calendar reconstructed by Alexander Thom from his analysis of standing stone alignments in Britain. There were initial suspicions that the disk might be an archaeological forgery. Peter Schauer of the University of Regensburg, Germany, argued in 2005 that the Nebra disk was a fake and that he could prove that the patina of the disk could be created with urine, hydrochloric acid and a blow torch within a short amount of time. However, he had to admit in court that he had never held the disk in his own hands, unlike eighteen scientists who had examined the disk. "When I first heard about the Nebra Disc I thought it was a joke, indeed I thought it was a forgery. Because it’s such an extraordinary piece that it wouldn’t surprise any of us that a clever forger had cooked this up in a backroom and sold it for a lot of money." Although Harrison had not seen the skydisk when he was interviewed, his skepticism was reasonable at that point, but the disk is widely accepted now as authentic and is dated to roughly 1600 BC on grounds of typological classification of the associated finds. As the item was not excavated using archaeological methods, even its claimed provenance may be made up, hence authenticating it has depended on microphotography of the corrosion crystals, which produced images that could not be reproduced by a faker. Dr. Harald Meller, lecturing to the Society of Antiquaries of Scotland in April 2008, gave a list of facts supporting the authenticity of the disc, and for its having been found at the site on the Mittelberg. The most persuasive of the latter was the discovery by the archaeologists — in the pit in which the looters said they had found the metalwork — of a fragment of gold leaf exactly fitting the gap present in the gold leaf covering of the 'sun' symbol when it was originally recovered. The disk was the center of an exhibition entitled Der geschmiedete Himmel (German "The smithied sky"), showing 1,600 Bronze Age artifacts, including the Trundholm sun chariot, shown at Halle from 15 October 2004 to 22 May 2005, from 1 July to 22 October 2005 in Copenhagen, from 9 November 2005 to 5 February 2006 in Vienna, from 10 March to 16 July 2006 in Mannheim, and from 29 September 2006 to 25 February 2007 in Basel. On 20 June 2007 a multimedia visitor center was opened near the discovery site at Nebra. The disk is part of the permanent exhibition in the Landesmuseum für Vorgeschichte (State Museum of Prehistory) in Halle. The state of Saxony-Anhalt has registered the disk as a trademark, which has resulted in two lawsuits. In 2003, Saxony-Anhalt successfully sued the city of Querfurt for depicting the disk design on souvenirs. Saxony-Anhalt also successfully sued the publishing houses Piper and Heyne over an abstracted depiction of the disk on book covers. The Magdeburg court assessed the case's relevance according to German copyright law. The defenders argued that as a cultic object, the disk had already been "published" in the Bronze Age, and that consequently, all protection of intellectual property associated with it has long expired. The plaintiff on the other hand, argued that the editio princeps of the disk is recent, and according to German law protected for 25 years, until 2027. Another argument concerned the question whether a notable work of art may be registered as a trademark in the first place.